A malicious menagerie of monsters is tearing free of the confines of the written page in this comedy-horror adventure. Zach (Minnette) and his mother Gale (Ryan) move from New York to Madison, Delaware, where his mother is taking up a position as the new vice-principal at the local high school. Zach befriends his neighbour Hannah (Rush), daughter of the secretive children’s horror author R.L. Stine (Black). Stine makes it clear that he wants Zach to stay away from Hannah, but Zach suspects that Hannah might be in danger from her father. Together with his new friend from school, goofy misfit Champ (Lee), Zach breaks into Stine’s house and unlocking the original Goosebumps manuscripts, unwittingly unleashes sheer havoc. It turns out that the creatures Stine has written about actually exist, with the sinister ventriloquist’s dummy Slappy (voiced by Black) leading the charge. It is up to Stine, Hannah, Zach and Champ to re-capture them and save the town from supernatural devastation. Robert Lawrence Stine’s Goosebumps series is massively successful and something of a cultural touchstone, spanning 62 books, numerous spin-offs and a TV show. Combining the spooky and the funny, many kids who were in middle school in the 90s regard Goosebumps as a nostalgic favourite. After a feature film adaptation failed to materialise in the late 90s with Tim Burton attached to produce, we finally have a Goosebumps movie. The screenplay, re-written by Darren Lemke from a draft by Scott Alexander and Larry Karaszewski, takes a tongue-in-cheek meta-fictional approach. The germ of the idea, with a fictionalised Stine trying to wrangle his creations after they’ve run amok, is a clever starting point and also lets the filmmakers cram all the fan-favourite characters, from the Mummy of Prince Kho-Ru to Murder the Clown to the giant praying mantis, into the movie. Apart from a pretty neat central twist, things go very predictably indeed. Goosebumps does what it says on the tin: there are laughs and tame scares and an okay, if not great, time is to be had by all. It does feel like a Disney Channel original movie with marginally better production values, and despite some moments of meta humour, it’s very formulaic. The visual effects lack polish and many of the CGI-created creatures are far from convincing. Perhaps the reasoning is that kids won’t be too picky about that sort of thing, but then again, kids today are used to the level of visual effects seen in the Marvel Cinematic Universe films. The most effectively creepy monster is Slappy the Dummy himself, and it is a good move to have him as the evil mastermind. This is due in no small part to the fact that Slappy is a physical puppet instead of a synthetic digital critter. Presumably a vestige of Burton’s involvement, there’s composer Danny Elfman doing a spot of self-parody with a very Elfman-y score indeed. The cast of characters is as standard for a kid-aimed adventure flick as they come: there’s the new kid, the girl he has a crush on, the goofy best friend, the well-meaning, sometimes-embarrassing mum, the adult with a mysterious secret that the kids uncover, etc. Minnette is not spectacularly interesting to watch, but he doesn’t project that self-conscious “I’m so cool” vibe most teen actors have. Rush is very appealing, looking more and more like Mila Kunis each time she appears in a new movie. Lee has been typecast as the dorky kid, but we’ll be darned if he isn’t the complete embodiment of that trope. Of course, the big draw is Black, whose Stine starts out creepy but eventually becomes more sympathetic as we root for him to regain control over the terrifying denizens that populate his books. Stine’s contempt for another famous horror author is the source of some of the movie’s funniest jokes. 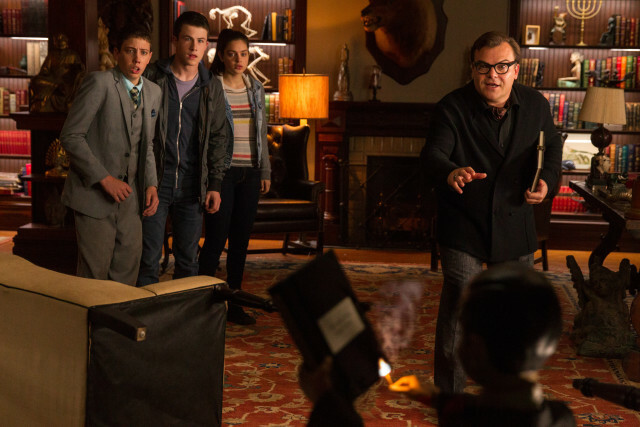 Goosebumps reunites Black with director Rob Letterman, who also helmed Gulliver’s Travels. 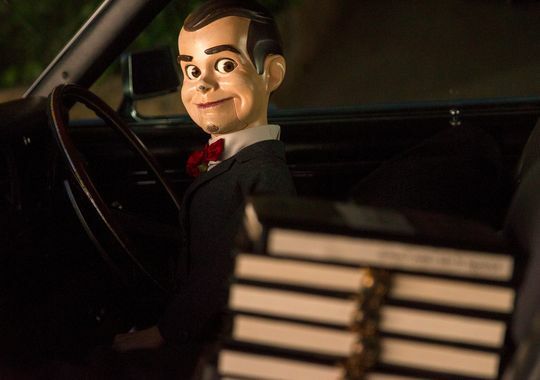 Thankfully, Goosebumps is less cringe-worthy than Gulliver’s Travels. Black’s having fun, but doesn’t go too over the top. Black also voices Slappy and the Invisible Boy – his delivery as Slappy is a cross between the Crypt-Keeper and Mark Hamill’s Joker, distinctive and entertaining. Genuinely enjoyable kids’ adventure flicks such as The Goonies, Monster Squad and of course E.T. : The Extraterrestrial have kind of gone out of fashion, with young adult novel adaptations taking their place. Super 8, in which Lee also had a role, is probably the closest we’ve come to that in recent years. 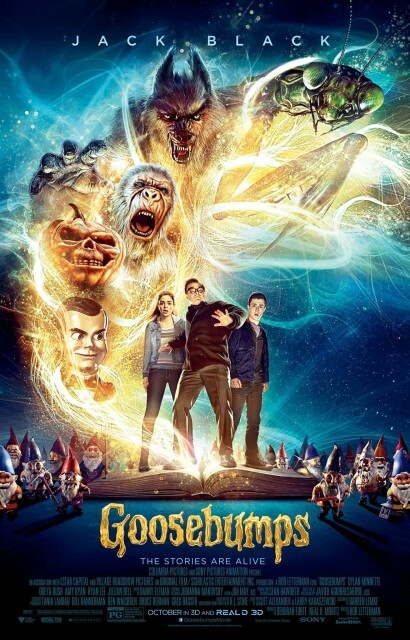 Goosebumps falls short of that magic, but it’s evident that the filmmakers do have a fondness for the source material and with this premise, they manage to wrap their arms around the vast number of stories in the book series and capture that overall spirit amiably. It’s hard to argue with the appeal of Jack Black trying to wrest a killer gnome off his face. Look out for the R(ea)L Stine himself in a cameo towards the end of the movie. 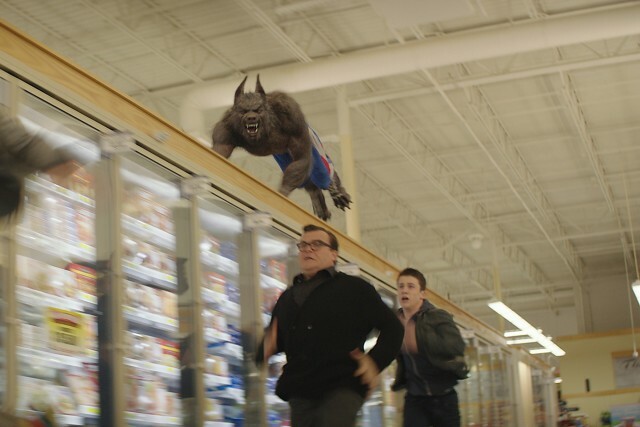 Summary: Goosebumps is largely an unremarkable, generic kids’ adventure, but the target demographic will be entertained and the meta-fictional approach does work.